In Google Sheets Level 1, you became more comfortable with how you can easily convert between Microsoft Excel and Sheets. In our Google Sheets Advanced class (Level 2), you will explore the more advanced functionality of Google Sheets and how it can help you become more productive in your daily work life. 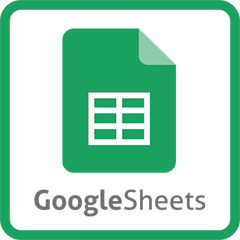 In the Google Sheets Advanced class, you will learn how to utilize advanced formulas and functions, PivotTables, and charts as a spreadsheet power user. Using real-world examples of collaboration and editing, we will walk you through the advanced features of Sheets so that you can tap into the Google Apps for business tools in more depth. Find out why Google Sheets has become a rival to Microsoft Excel for spreadsheet users of all skill levels! It is also recommended that you a Google Account setup prior to starting class. You can create your free Google account here. This class is currently offered in a private format.